Housing land value growth in the UK stalled in the final months of 2018 as buyer caution increased in the face of Brexit uncertainty, new research has found, but Scotland the Midlands bucked the trend. Slowing new homes sales rates and higher build costs, particularly in London and the South East, contributed to the flat growth, according to the report from real estate advisor Savills. Flat growth in the final quarter of 2018 left UK greenfield land values up just 1.9 % year on year, while urban land values averaged 6.2% growth, the residential development land index also shows. For the first time in two years, land values in the South East recorded marginal falls. Greenfield values were down by an average of 0.6% in the last three months of 2018, as house price growth slowed due to affordability constraints and political uncertainty. By contrast, in Scotland and the Midlands, both regions that are at different points in their housing market cycle to London and the South East and continue to see house price growth, greenfield land values in these regions increased by up to 1.5% in the final quarter of last year and up to 7.5% year on year. The report points out that house price growth of 4.8% in Scotland, 5.5% in the East Midlands and 5.3% in the West Midlands, surpassed the national average of just 3.3% and underpinned demand for land. Despite prevailing uncertainty, there is still new buyer interest for sites and the report also reveals that sentiment has remained remarkably resilient, with 97% of respondents in the Savills land agent survey reporting positive or neutral sentiment. 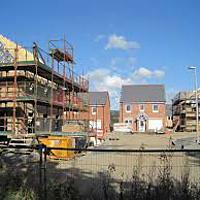 However, high levels of supply of development land are adding to buyer caution. The success of new planning policy in bringing forward land for housing means the supply of permissioned land remains is also now well ahead of national housing delivery. Some 362,000 homes were granted consent in the year to end the end of the third quarter in 2018 against new housing delivery closer to 232,000. ‘While rates of new build home sales have remained relatively stable, there are clear signs of increased home buyer caution and greater reliance on incentives to get sales over the line. Clarity on Brexit would make a big difference to this picture,’ said Lucy Greenwood, Savills residential research analyst. ‘Over the mid-term, cyclical changes in the housing market and housing policy will continue to dictate both turnover of development land and the price at which land trades in different locations. This said, land values are currently pitched at a lower level relative to house prices than in previous cycles, which will minimise the downside risk,’ she added.